Sometimes, like today, I find myself nearing the end of a Sunday and I realize that I didn’t set foot out the door. I didn’t go anywhere, or breathe the autumn air, or visit anyone. But I had just the day I needed, and I spent it on myself. The week’s stresses and small anxieties had to be processed. My body needed rest, especially after last weekend’s Rhinebeckathon. * There was a cat to tend, and laundry to do. There were corn muffins to make, and phone calls with friends to be had. There was tea, and an apple, and peanut butter on celery. Most of all, there was knitting. I have only 50 rows — just 5000 stitches — left to knit on my Cedar Falling Waters shawl, and I finished a third Hill Country hat. There’s nothing else I would rather have done today. I think I’m ready for the week to come. *Rhinebeck was cold, happy, tiring, fun, wet, and satisfying. I’d go back again right this minute, if I could. Snuggle in and knit, sister! I love seeing the spinning wheel in the background.love to you. I have a large sign above my computer reminding me to "relax" sounds like you have it under control!!! I love the colors happening in this shawl. Can't we get more than a sneaky peek? 🙂 What is the yarn (or did you already tell us)? 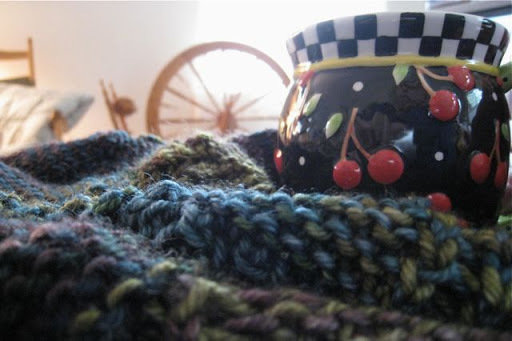 It looks chunky and warm.When I followed Clara's link to the free pattern on Knitter's Review for the Hill Country Hat is was all blurry and I could not read it . 😦 I don't know if they fixed the link or not. I guess I need to check that out because it looked like such a nice, quick knit.I would go back tomorrow to Rhinebeck too Jane if I could! So many things I passed up buying. Oh well, I'll know better for next year! Of course, one of the highlights was getting to meet you in person!! Love the Hill Country Hat! Thanks for the link the other day. I made one in just a few hours – what a great pattern. A quiet day at home sounds just perfect to me! A day of nesting is my favorite kind of day. 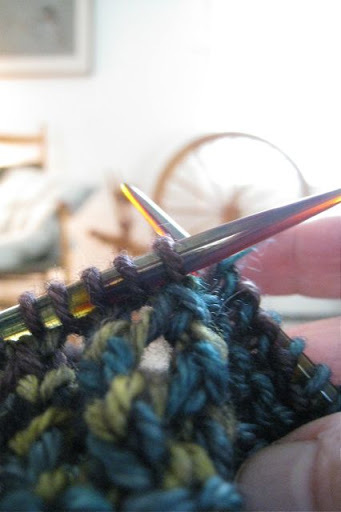 And to do it with such gorgeous yarn, on those needles, WELL. That's a day indeed.